Last week I introduced OcracokeNavigator.com, a free, comprehensive and interactive Ocracoke Island mobile web app for use on your smart phone, tablet, or laptop browser. A reader commented that he wished he could download the audio tours to his tablet so he could listen and follow them even though he does not have a smart phone. Stefen Howard, creator of the app, has taken this suggestion and added another page to his app. 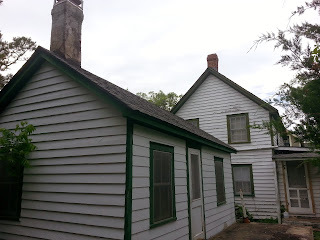 You can now click on this link to download all of the audio files: https://www.ocracokenavigator.com/audio-tours-download/. Now you can listen to the audio tours on your device even if you do not have a smart phone, or when no Internet service is available. This month's Ocracoke Newsletter relates the story of the prohibition-era rum runner Messenger of Peace that brought much pleasure to the residents of Portsmouth. You can read it here: http://www.villagecraftsmen.com/news062115.htm. I play poker every Friday night. It is just a guys' night out, and the stakes are low (nickel, dime, quarter poker), but it is great fun. We've been playing regularly, usually at my house, for about 14 years. Last Friday night Lou Ann had planned to spend the evening with her friend Ellen who had rented a cottage for two weeks. When Lou Ann came home for a few minutes after her Ghost Walk the heavens opened up with torrential rain, thunder, and lightening. We were in the kitchen drinking beer and playing poker. Although Friday night poker is a guys only event, everyone at the table felt sorry for Lou Ann because the storm was keeping her from going to visit her friend. We all agreed to break our rule, and let her play "just this one evening." This, of course, is a king-high straight flush. 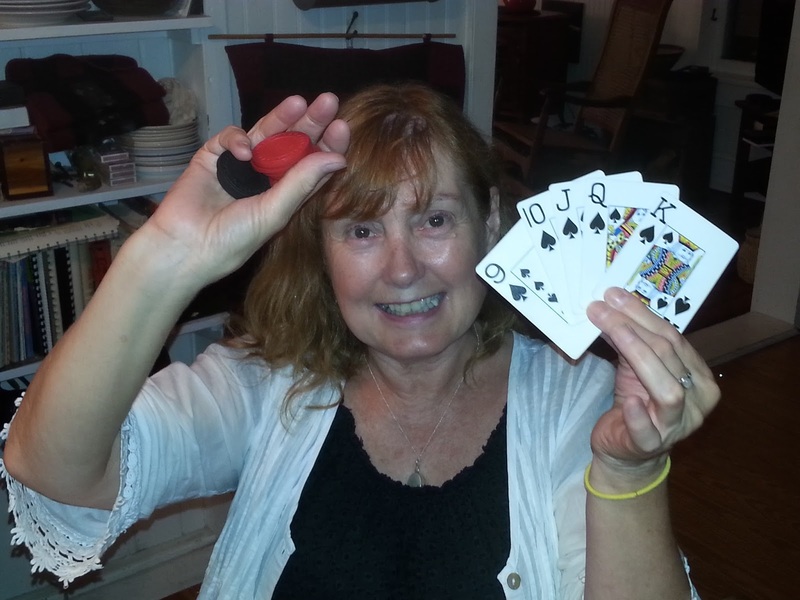 There is only one other natural poker hand that will beat this one...an ace-high straight flush. Congratulations, Lou Ann! It is going to take another thunder storm for us to let a woman play again! 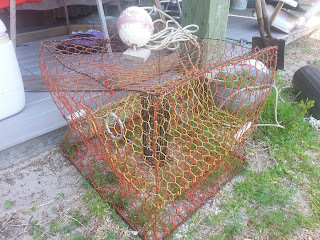 I have often wondered why crab pots are called "pots." 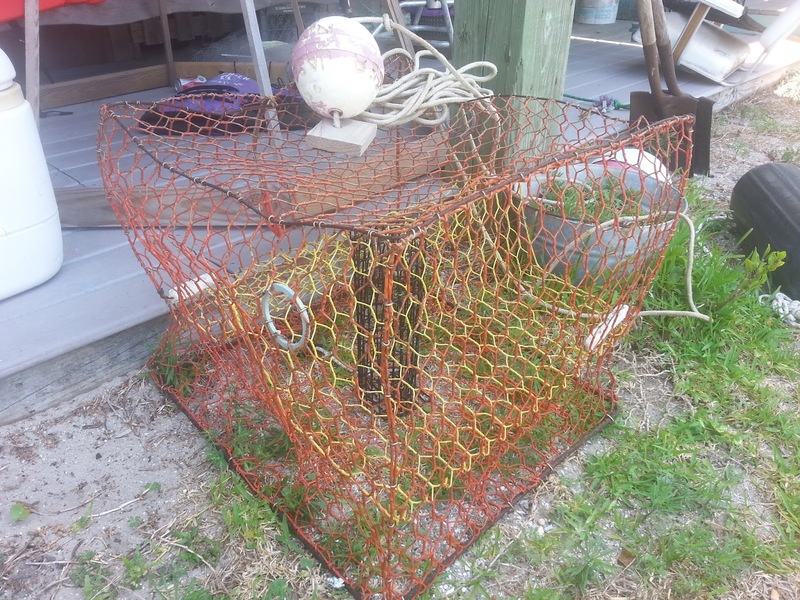 (See our post of two days ago for more information about crab pots.) According to William Warner in his book, Beautiful Swimmers, very early devices for catching English shore crabs were willow and hazel stick baskets with a single funnel that looked much like a flower pot. The modern crab pot used in America was invented in the 1930s in Virginia. It does not look like a pot at all, but still retains that name. 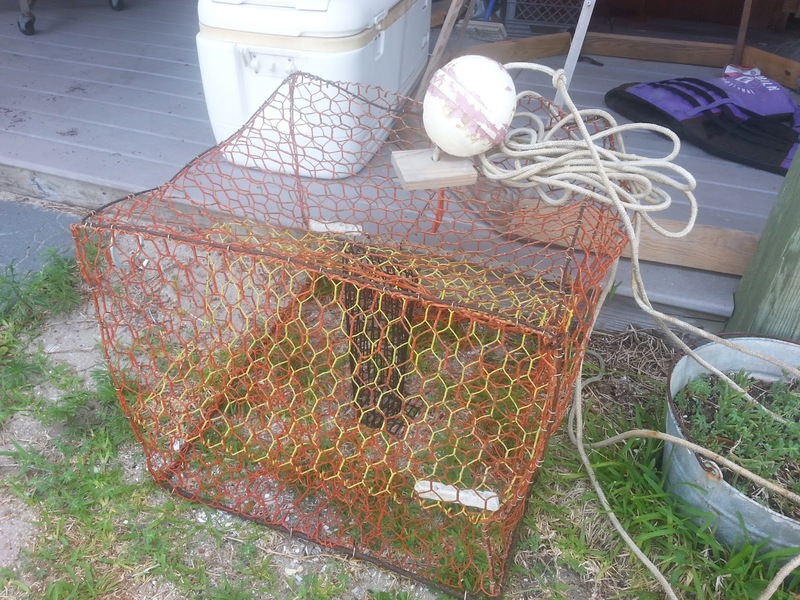 Modern crab pots are light and airy, necessary attributes to attract and catch blue crabs that live in Pamlico Sound and the Chesapeake Bay. According to North Carolina State University, "Currently, crab pots...are used in harvesting approximately 95% of total hard blue crabs in North Carolina. The huge jump from 30% crab pots used in the 1950s show that crab pots are more efficient and effective, and thus preferred method for the commercial fishery." But the mail must go, yes the mail must go. But to Ocracoke the mail must go. The mail's arrived on Ocracoke! And all is well on Ocracoke, all is well on Ocracoke. Passengers on ferries to Ocracoke often notice small buoys floating near the channels, but they don't always know that they are tethered to crab pots. A crab pot is a cubical cage made of steel wire (like chicken wire) with a cylindrical "bait box" in the center, four conical funnels (or "throats") at the bottom edges through which crabs enter, and two wider funnels inside the pot leading to an upper chamber, the "parlor," (crabs naturally swim upwards trying to escape) where they remain contained until the fisherman returns). A "cull ring" (visible in the bottom photo) allows smaller crabs to escape. To learn more about crabs and crab pots, click on this link: http://cmast.ncsu.edu/cmast-sites/synergy/bluecrab/bscrab.html. ...A new, comprehensive and interactive Mobile Web App: Ocracoke Navigator! 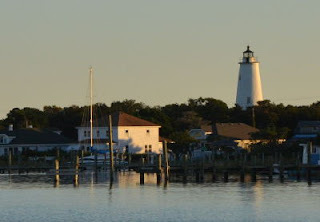 Ocracoke Navigator is a thorough introduction to Ocracoke for first-timers, a handy resource for frequent visitors, and a comprehensive guide to nearly every aspect of Ocracoke Island. And much more, including Arts, Dining, Lodging, and Recreation! As Stefen says, "It's like having an Ocracoke native in your pocket!" Take a look at Ocracoke Navigator today...and check back often. More information (about local businesses and island history) is being added regularly. 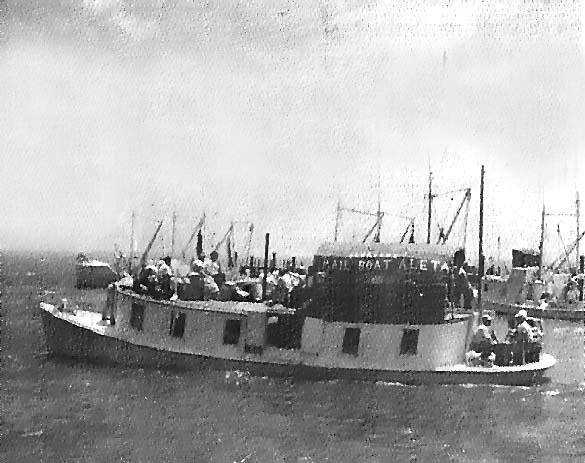 We have just published our latest Ocracoke Newsletter, the story of the grounding of the Prohibition-era rum runner, Messenger of Peace, at Ocracoke Inlet in August of 1921. An interview with Ocracoke native (and Portsmouth Island resident) Mattie Gilgo illustrates how delighted some folks were when this vessel fetched up here! You can read the article here: http://www.villagecraftsmen.com/news062115.htm. Also...an additional word about my latest book, Howard Street Hauntings: The book is available from Village Craftsmen on-line (www.villagecraftsmen.com/islandbooks.htm). To display the most economical shipping costs (USPS Media Mail) when ordering on-line, choose "More Carriers" and "USPS Media Mail." 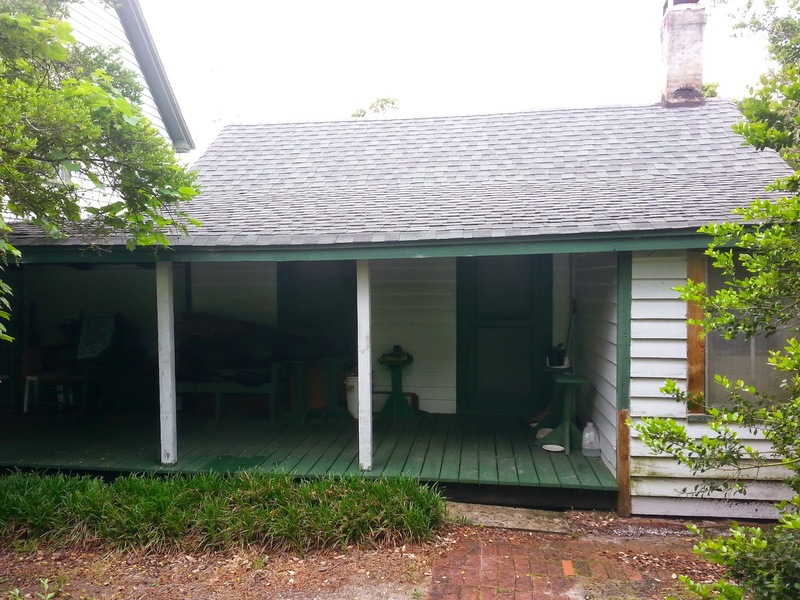 In the mid-1950s Ruth and Latrobe Carroll spent several months living on Ocracoke. They were fascinated by the village & her people, but especially by the many cats on the island. 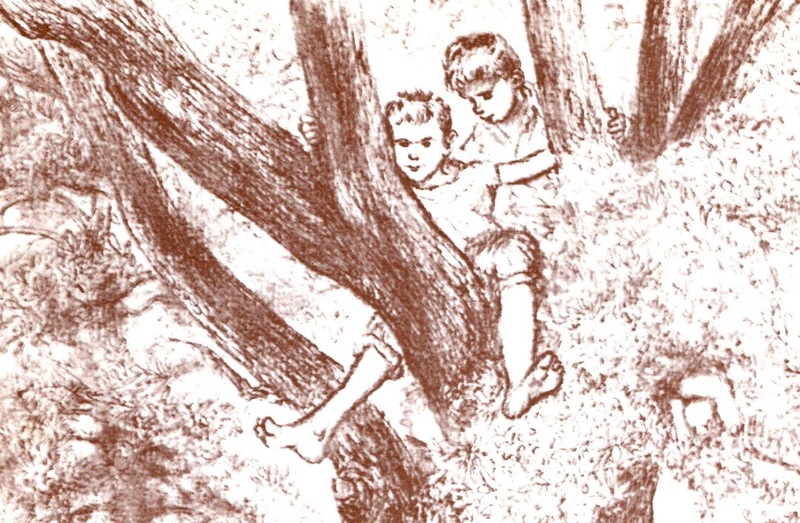 Together they wrote and illustrated a children's book, Digby the Only Dog. Digby is a loveable dog who makes friends with every animal, especially every cat, and person on the island.. He is the island's only dog, but when other dogs are brought to Ocracoke, they expect him to chase cats. Digby refuses, and earns the respect of the dogs, who agree to never chase a cat again. Ruth Carroll illustrated the book with delightful images that captured the spirit of Ocracoke 60 years ago. Although much on Ocracoke has changed since the 1950s, much remains the same, as you can see from the photo of my grandson, Lachlan, below. I hope you can find a copy of Digby. It is a wonderful children's book! Our latest Ocracoke Newsletter is Part II of Crystal Canterbury's account of her first visit to Portsmouth Island. You can read it here: http://www.villagecraftsmen.com/news052115.htm. The following Pirate Code was drawn up in 1721 by the mutinous crew of the merchantman Rover (later the Royal Fortune). The crew became pirates, and elected Bartholomew Roberts as their captain. This detailed document illustrates the generally democratic policies of pirate bands, and was quoted by Captain Charles Johnson in his 1724 book, A General History of the Robberies & Murders of the Most Notorious Pirates. I. Every Man has a Vote in affairs of Moment, has equal Title to the fresh Provisions, or strong Liquors, at any Time seized, and may use them at pleasure, unless a Scarcity make it necessary, for the good of all, to Vote a Retrenchment. II. Every Man to be called fairly in turn, by List, on Board of Prizes, because, (over and above their proper Share) they there on these Occasions allowed a Shift of Cloathes: But if they defrauded the Company to the Value of a Dollar in plate, Jewels, or Money, MAROONING was their punishment. VIII. No striking one another on Board, but every Man's Quarrels to be ended on shore, at Sword and Pistol Thus: The Quarter-Master of the Ship, when the Parties will not come to any Reconciliation, accompanies them on Shore with what Assistance he thinks proper, and turns the Disputants Back to Back, at so many Paces Distance. At the Word of Command, they turn and fire immediately, (or else the Piece is knocked out of their Hands). If both miss, they come to their Cutlasses, and then he is declared the Victor who draws the first Blood. IX. No Man to talk of breaking up their Way of Living, till each had shared £1000. If in order to this, any Man should lose a Limb, or become a Cripple in their Service, he was to have 800 Dollars, out of the public Stock, and for lesser Hurts, proportionately. X. The Captain and Quarter-Master to receive two Shares of a Prize: the Master, Boatswain, and gunner, one Share and a half, and other Officers one and Quarter. 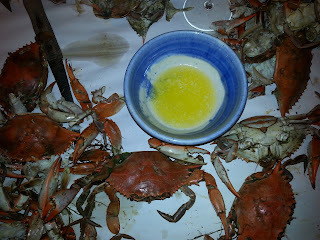 Friends in the kitchen, newspaper spread on the table, beer, a bowl of melted butter...and steamed crabs: what better way to spend an Ocracoke Island evening? 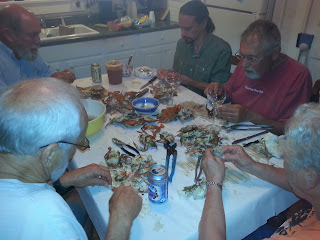 We enjoyed our first steamed crabs of this season after the Ocracoke Opry last Wednesday night. The picking was great! Several powerful hurricanes and storms struck the Outer Banks in July and August of 1842. Judi Heit (on her blog site) and Sonny Williamson (in his book, Shipwrecks of Ocracoke Island), document several vessels that were wrecked, with many lives lost (the Marie, the Ann Stille, the Eliza Marie, the Transport, the Henry Camerden, the Pioneer, the Granary, the Harrison, the John Hughes, the Kimberly, the John L. Durand, the Kilgore, and the Congress). 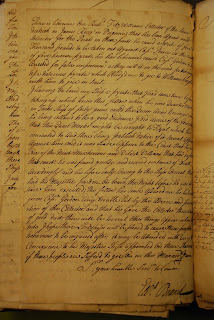 Read Judi Heit's blog post for more information about the hurricanes of July 15, and August 24, 1842. In 2007 I published a post (with photos) of an ancient jasper point that my neighbor, Edward Norvell, found on Ocracoke's beach. 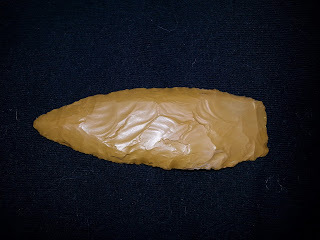 Although it is difficult to determine the provenance of an artifact only from photographs, the fact that the point has a flute on one side and a few flakes that go past the midline, plus a bevel on the opposite side from the flute, indicates that this is a Clovis "preform" (a not totally finished point, basically). In addition, it appears that some time later (there is no way to tell how much later) someone did further sharpening on the edges. In other words, someone began to make a Clovis point, got pretty far along, then abandoned the project. Then either she or someone else decided to sharpen it without finishing it up into a full Clovis point. The fact that it is not waterworn indicates it was buried under the sand offshore, then was dredged up and carried in during a storm. All of this suggests that Clovis occupations were established near Ocracoke around 13,000 years before the present. 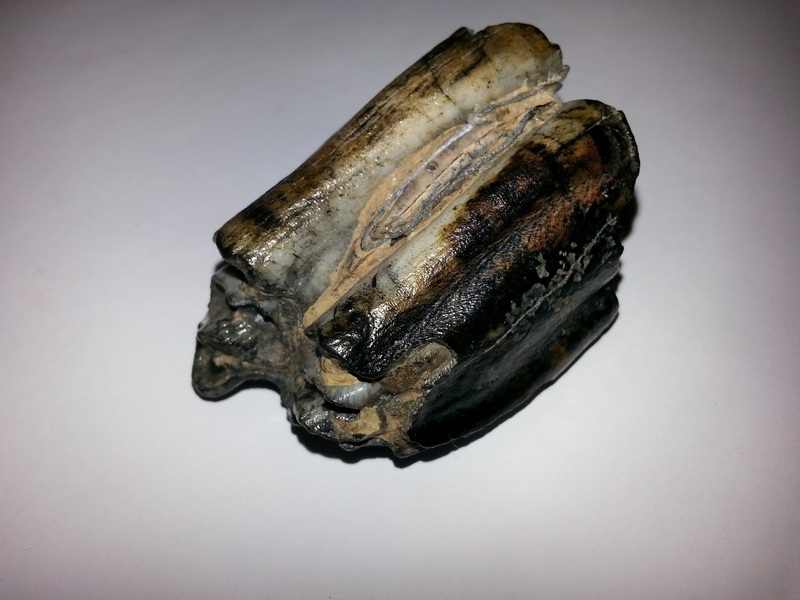 Earlier this year, I also published a blog post about a fossilized bison tooth that was found in the water near Springer's Point. So, now we know that large mammals and Paleo-Indians were roaming these parts at the end of the last ice age, when sea levels were much lower and the coast of North Carolina was 70 to 80 miles farther seaward. For more information, read Pat Garber's recent article in the Ocracoke Observer. Her article was written before we received the latest information about Edward Norvell's jasper point. Not long ago my son-in-law, Fiddler Dave, was in Colonial Williamsburg with the Molasses Creek band. He visited the Public Gaol, and sent me a droll email with this subject line: "Your ancestors lodged here!" According to information on the web identifying southeastern Virginia highway markers, "[t]he Williamsburg Gaol was erected in 1701. It was a brick prison with the dimensions of thirty by twenty feet with two stories, and was used for both prisoners and the jailer with his family. In addition to the interior rooms, there was also a courtyard, which was enclosed by walls so as to prevent escape during the prisoners’ recreation time. It was known 'as a strong, sweet Prison' and would be used into the period of the Civil War and beyond then .... Another set of reputable prisoners, were the associates of the infamous pirate Blackbeard. They were all executed in 1718. This was Virginia's chief prison which housed debtors and criminals and served as the jail for the General Court in the nearby Captiol. Here Blackbeard's pirates, captured in 1718, were confined until the day of their hanging. Leg irons, an exercise yard, food slots, and criminal cells with primitive sanitation have been restored to their early appearance. According the official history of Colonial Williamsburg, "Virginia's general assembly ordered a 'substanciall brick prison' built in Williamsburg soon after it decided to make the city the colony's new capital. Known as the Public Gaol, the building's construction was authorized by an act of August 1701.... The Public Gaol's most celebrated occupants were 15 henchmen of the pirate Blackbeard, caught in 1718.... [T]he air [was described as] truly Mephytic.... [T]he Public Gaol was a place of discomfort and pestilence. Gaol fever – probably typhus – broke out from time to time, and the unheated cells often were overcrowded.... Manacles and chains were familiar parts of gaol life.... Strong timbers were laid beneath the cells to prevent 'under mining.'" William Howard, quartermaster to Blackbeard the Pirate, and probable early owner of Ocracoke Island, was confined to the Public Gaol in 1718, and remained there into the fall, so he was not among Blackbeard's crew when his captain was captured and killed on November 22 by sailors of the Royal Navy under the command of Lt. Robert Maynard. Howard was tried and sentenced to be hanged, but King George's pardon (The Act of Grace) was delivered to Williamsburg the day before his scheduled execution, so the quartermaster was released. My ancestor may have lodged at the gaol, but he died three quarters of a century later on Ocracoke Island. My new book, Howard Street Hauntings, has just been published. This is a sequel to my first book, Digging up Uncle Evans, which was based on our popular "Down Point" Ghost & History Walking Tour. The current volume, Howard Street Hauntings, is based on our "Around Creek" Ghost & History Walking Tour. Howard Street Hauntings includes the stories of Old Diver (the unfortunate sailor whose ghost prowls graveyards on British Cemetery Road), Mad Mag (a long-dead housewife whose peculiar ways continue to frighten islanders), and Frank Treat Fulcher (a salty old sailor who became a Methodist preacher). 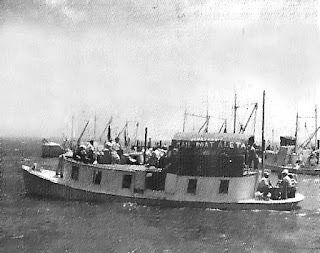 You can also read about the woman who kept her casket in her parlor for seven years, the ghost ship of the Outer Banks, the suspended casket, and the phantom freighter, as well as tales from WWII, a recipe for Ocracoke Island meal wine, dramatic accounts of rescues by the United States Life-Saving Service, and more. 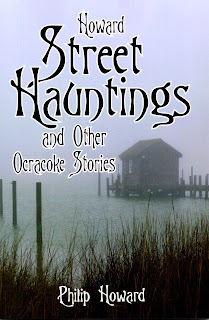 Howard Street Hauntings is available at Village Craftsmen, other Ocracoke Island stores, and on line at http://www.villagecraftsmen.com/islandbooks.htm#Hauntings. Also, on that same page, you can order Digging up Uncle Evans, or the two-book set. On March 25 of this year I published a blog about pilot and photographer, Garrett Fisher and his spectacular aerial photos of the Outer Banks. 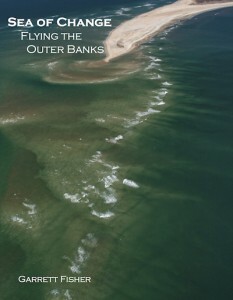 Garrett has just published a book of his photos, Sea of Change, Flying the Outer Banks. 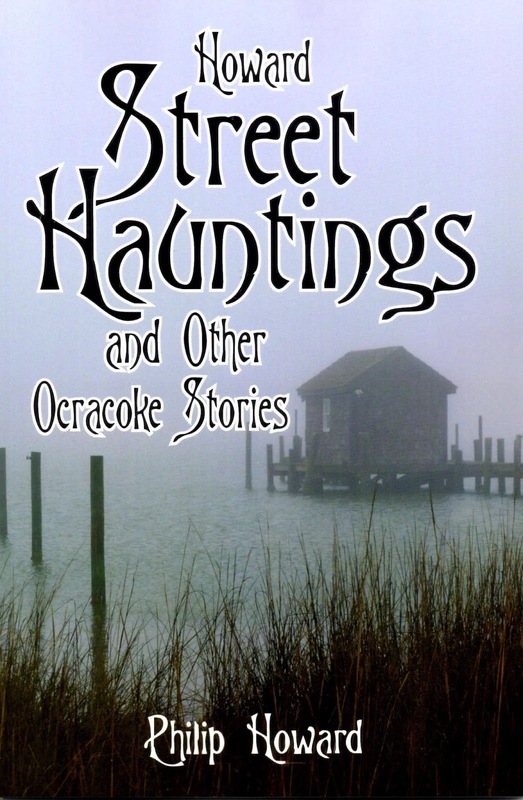 The book is available for purchase on line, and he hopes to have them in stores on Ocracoke this summer. In his book, Fisher observes that "the essence of the Outer Banks is change.... Sand, surf, and sky are in a constantly rhythmic state of change.... Every single time I flew, the sand, ocean, currents, inlets, and sky looked different, [and] it was a matter of wholesale surprises each time...."
Sea of Change shows the Outer Banks as "more beautiful than most of us realize" and introduces us to aspects of these islands "that people do not know..., showing these unknown and poorly accessed areas in ways that are difficult if not impossible to see on the ground." Garrett Fisher's book is a beautiful contribution to our understanding and appreciation of this fragile string of islands some of us call home. 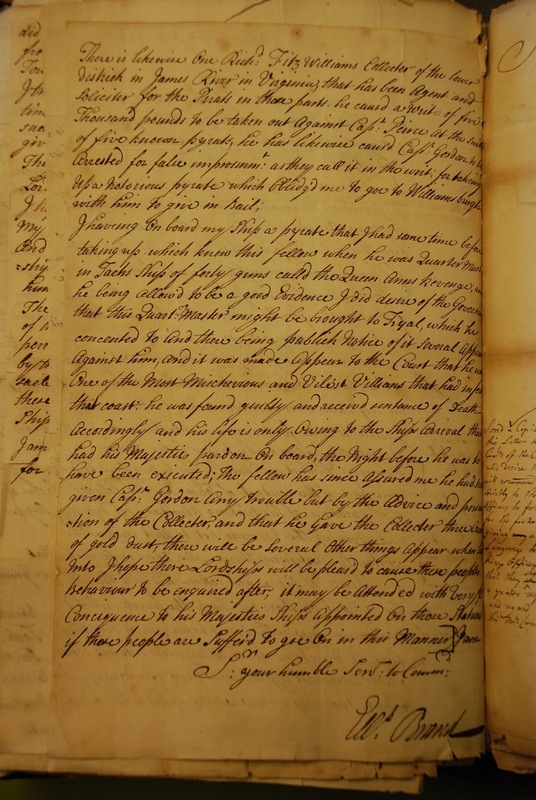 On May 28 I wrote a blog post that included Kevin Duffus' photograph of a letter written in 1719. A reader commented on the lovely handwriting. And that reminded me of my great-grandfather's nineteenth century shipwreck reports. James Howard's penmanship is not as beautiful as Ellis Brand's, and his spelling and grammar are unconventional by today's standards (spide, redeness, flud, etc. ), but his handwriting was superior to most of ours today. What a difference a few generations make! I seldom write letters, and my handwriting is a blend of printing and cursive. School children today are not even taught penmanship or cursive writing. All the more reason to treasure these letters and reports from the past. Not long ago I was sitting on the pizer with Cousin Blanche. I can't remember what we were chatting about, but something reminded Blanche of a song from her youth (Blanche is 95 year old). She began to recite the lyrics of "A Good Man is Hard to Find." (I did some research afterwards and discovered this song was composed and performed by Eddie Green during the time of piano rolls (1918). The song became a classic Blues standard, and was performed by Bessie Smith, Sophie Tucker, Frank Sinatra, and Brenda Lee. Flannery O'Connor wrote a short story with the same title in 1955. To see him lying in his grave. But Blanche was just getting started. Next she began singing (not just reciting) "The Sidewalks of New York." That reminded her of "A Bicycle Built for Two." I listened reverently as sweet melodies wafted down the sandy lane. The song was over much too soon, but, alas, it was time for me to depart. Reluctantly, I arose, thanked her for the impromptu performance, and assured her I'd be back again before long. Tonight, from 4 - 5 pm participants in Donald Davis' Storytelling Workshop will be sharing stories at Deepwater Theater. From 5 - 7, at the Ocracoke Preservation Society Museum property, the Pony Island Restaurant will be providing fresh, locally caught fried fish and grilled chicken dinners for $15 a plate. 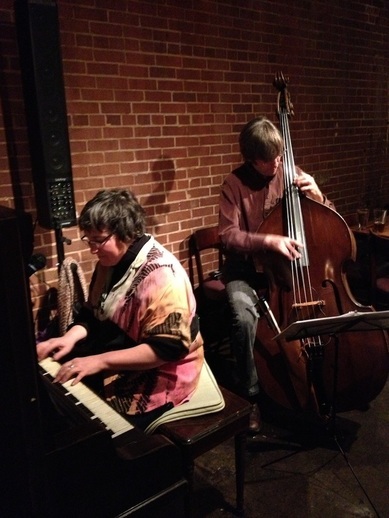 Between 6 & 7pm, at Berkley Manor, you can listen to Mahalo Jazz 2 (Alison Weiner on piano, vocals, and melodica) and Robbie Link (upright bass), two eclectic musicians coming together to have their delightful way with jazz standards and original tunes. While there, you can also place silent bids on a wonderful assortment of fine art pieces donated by islanders and festival participants. Be sure to stick around for the live auction which starts at 7 o'clock. 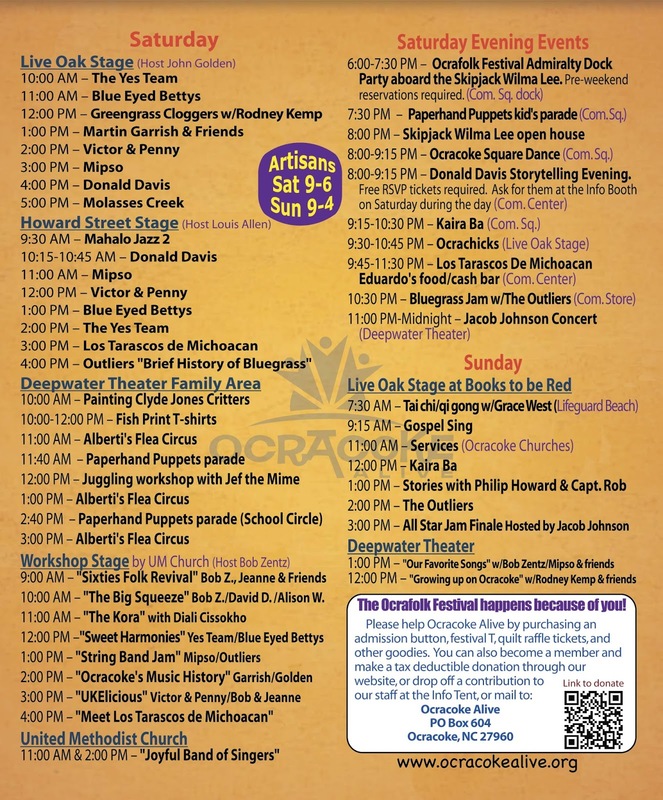 Afterwards head over to the Live Oak Stage (at Books to be Red) for a World Music Jam at 9 o'clock...then to the Community Center for the Donald Thompson Blues Band (and cash bar) at 10 pm. 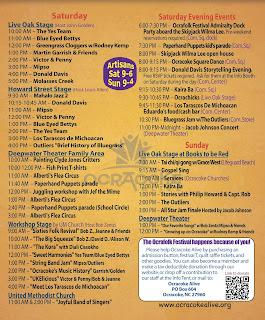 Of course, the rest of the weekend is filled with more music, arts & crafts, dance, and other creative events. I will be taking it all in, and will be back Monday morning! Every year at the Ocracoke Festival I lead a traditional island square dance. The Ocracoke square dance was held regularly on the island from the mid 1700s until the early 1960s. 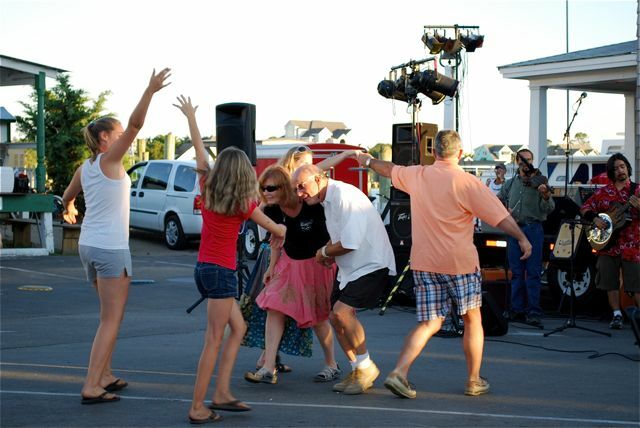 In recent years the dance has been a feature of the Ocracoke Festival, the island's July 4th celebration, several fall get-togethers, and various other events. In the eighteenth and nineteenth centuries the dances were often held in private homes. Later they were held in public spaces including the lodge of the old Doxsee Clam Factory, on the dock at Captain Bill Gaskill’s Pamlico Inn, at Stanley Wahab’s Silver Lake Inn (now the Island Inn), and in the building that now houses the Ocracoke Variety Store. 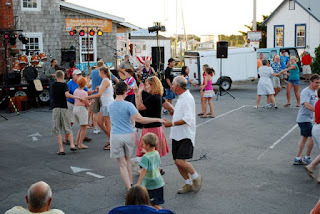 The Ocracoke Island dance is actually a big circle dance, much like big circle dances performed in the Appalachian Mountains of the eastern United States. However, islanders traditionally referred to their dance as a square dance. It is great fun...and easy to learn. Come out to the Community Square at 8 pm on Saturday for good music, energetic dancing, and good fun! 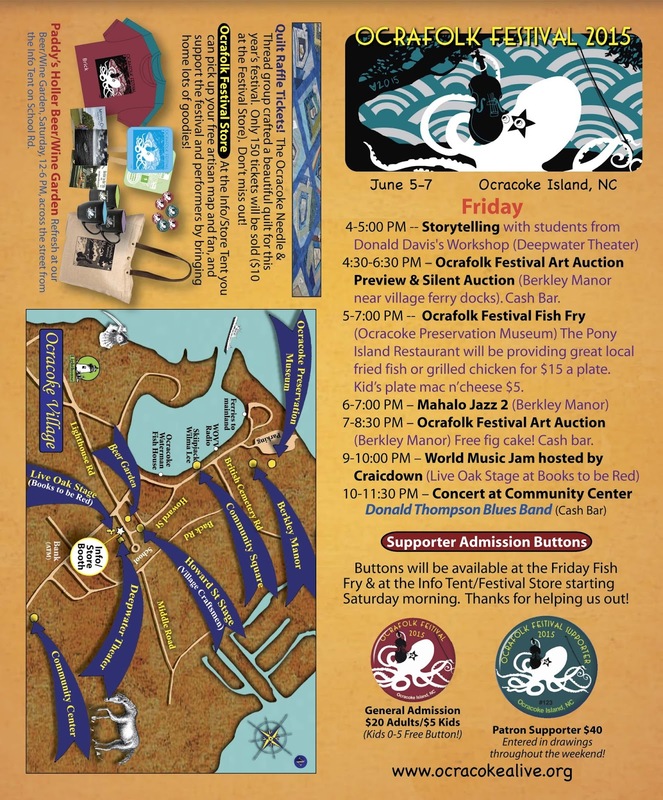 The 2015 Ocracoke Music & Storytelling Festival begins this Friday, late afternoon, with stories, fish fry, art auction, jazz, blues, and a world music jam. The festivities continue all day on Saturday & Sunday morning, and include almost non-stop music plus clogging, juggling, a puppet parade, flea circus, additional stories...and more! 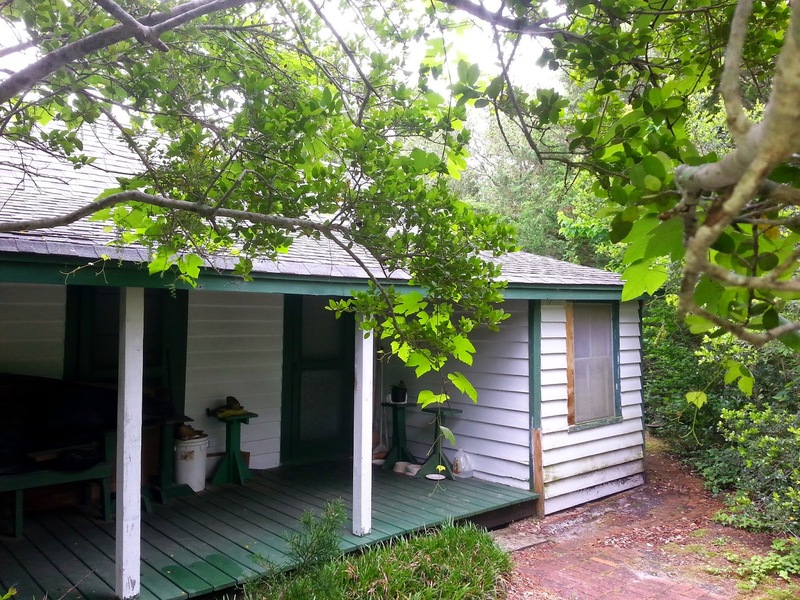 Saturday evening features an open house on the skipjack Wilma Lee, and a traditional Ocracoke Island square dance, along with more music and storytelling. 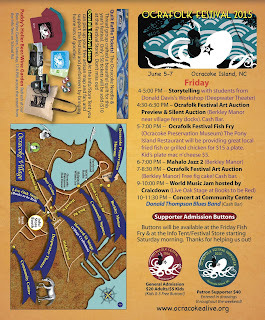 The Ocracoke Festival showcases an outstanding collection of talent from the island, North Carolina, and elsewhere. What a great weekend! Hope to see you. First there were mice and rats...brought to the island centuries ago as stowaways on sailing ships. I don't know how nutria got here, but I see them every once in a while. Then, sometime within the last 40 years, someone released a pair of minks. Next it was squirrels. What were these people thinking? Deer are another recent arrival. They probably swam over here from Hatteras. I have seen two, just north of the NPS campground, and tracks are fairly common "down below" (anywhere north of the village). 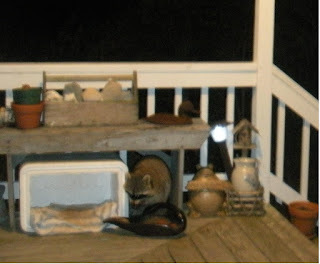 Five years ago Gene Ballance sent me this photo of a raccoon foraging on his back porch. It was the first I had heard of raccoons on Ocracoke. Just last week Frankie Garrish told me he startled two raccoons who were feeding in the cat dishes in Cousin Blanche's yard. There have been raccoons on Portsmouth Island for many years. I suppose a couple of them were washed over to Ocracoke during a storm. It is probably impossible, now, to get rid of them. When I was a child my grandparents' house (the house I live in today) had a detached kitchen. By the time I was born a kitchen (with a newfangled kerosene cook stove) had been installed inside the house. The old kitchen was converted to a spare bedroom. Eventually, termites and water damage did so much damage that the kitchen was torn down. Blanche told me she remembers when some islanders constructed outdoor temporary summer kitchens from saplings and tree branches. They would be used for just one season, then dismantled. But they served to keep the intense heat from the wood cook stove out of the main house.